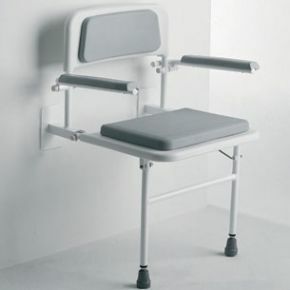 Wall Mounted Shower Seat With Padded Back and Arms. This wall-mounted shower seat comes with a comfortably padded back and armrests as standard, and your choice of a standard or horseshoe-shaped seat panel. 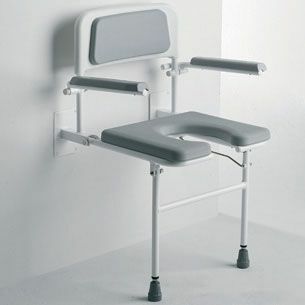 The horseshoe seat makes personal washing easier by allowing greater access even whilst sitting down. The padded armrests can be folded up independently to allow for side transfer, or used as an extra support whilst sitting or rising. The legs are adjustable in height to the chair can be mounted at the perfect wall height for an individual user, and the whole unit folds away against the wall at other times. Choice of standard or horseshoe type seat. Very happy with the item. However when it arrived, the courier did not ring the doorbell/knock on the door - and someone WAS in - the parcel was left outside the porch. Anyone could have taken it. Further, no note was pushed through letterbox. It was found by chance in the evening, the cardboard completely sodden following a storm. Fortunately the item itself was inside a sealed plastic bag. The service was very good and the chair arrived 3 days after I ordered it. It is ideal for my parents to use in the shower and they are very happy with it.